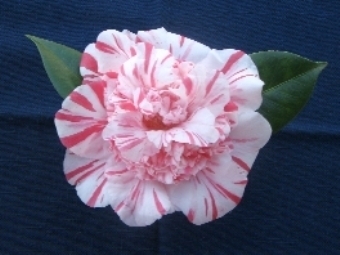 White with flecks and streaks of dark red coral pink and light red to medium pink mixed in an irregular pattern throughout the bloom. It has light yellow anthers and yellow filaments. The plant habit is spreading and open. The flower is long lasting. The bloom has 2 rows of guard petals, numbering about 14 to 18. The outside row flat or slightly curved back and the inside row often folded and turned upright producing “rabbit ears”. The inside of bloom is a profusion of about 110 to 190 petaloids mixed with hidden stamens and a few larger curved irregular upright petals. It won the Best Seedling award at the Gulf Coast Shows in the early 1980's. This 30 year old chance seedling C. japonica first bloomed in 1979. Habit is spreading and open with slow growth rate. It does not have landscape potential. Originated and registered by John M. Davy of Pace, Florida and propagated by Panhandle Select, LLC of Milton, Florida.